Fort Worth’s school board has named interim superintendent Walter Dansby its lone finalist to be the district’s next superintendent. KERA’s Bill Zeeble reports Dansby becomes Fort Worth’s first African American leader in the district’s 129 year history. He started working at Fort Worth ISD in 1974. Fort Worth School Board Member T.A. 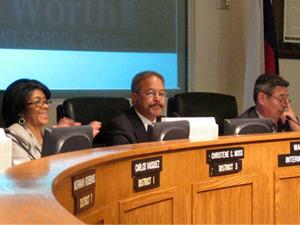 Sims moved that Walter Dansby be named the sole finalist to lead Fort Worth’s school district. Sims: ...and give public notice thereof, as required by law. The immediate response was applause and a standing ovation from the board and the audience. Trustees, including Carlos Vasquez, took turns praising Mr. Dansby. Vasquez said he liked Dansby from the start. Vasquez: We had plenty of qualified candidates come before us. Many that were impressive. But none that were impressive enough as Mr. Dansby. Trustee Christene Moss, an African American, said Dansby stood out among all the applicants. She said the school board has never elected a minority president but now the district has its first African American leader. Moss: Thank you again, Mr. Dansby. You have our support until you do something wrong. Dansby: That’s not the qualifying thing about me. It’s about what I stand for, the things I do and the fact that it’s not what I say but what I do. Walter Dansby says his first task is to tackle the district’s financial problems. Because of state funding cuts, Fort Worth faces a budget shortfall this year in the range of $50 million. Dansby: So that we can have people at ease in the next calendar year. We have plans for that. We also have a workshop scheduled for the 21st, our entire team will work all day on things that concern our budget. By Texas law, Dansby must wait 21 days before the district can officially hire him. He currently earns $270,000, less than Melody Johnson, who stepped down last Spring. Trustees offered no details on any salary change.